← Fire razes Gboko main market, traders lose millions . 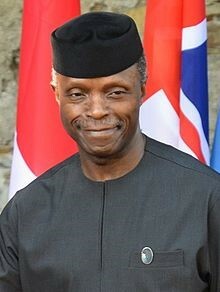 Vice President, Yemi Osinbajo, in his speech, admitted that there might be socio-economic and political challenges but charged Christians to believe in Nigerian project and ability of God to restore its years of loss. He said this while addressing Christian leaders from across Nigeria gathered at the National Ecumenical Centre, Abuja, on Sunday, for an interdenominational prayer service to appreciate God for His awesome love and mercy for Nigeria as it marks its 58th independence anniversary. The service provided an opportunity for reflection and nostalgic memories of Nigeria and how it has survived several turbulent moments to emerge stronger in unity and diversity. Vice President, Prof. Yemi Osinbajo, Chief Justice of Nigeria, Walter Onnoghen, and Secretary to Government of the Federation (SGF), Boss Mustapha, led other government officials to the annual interdenominational service. There were scriptural readings and gospel ministrations that renewed the hope, commitment and patriotism of Nigerians to the Nigerian project. He used several scriptural versus to justify his conviction that God’s Face is still tilted towards Nigeria and His glory will definitely shine in no distant time. General Overseer, Deeper Life Christian Bible Church, Dr. Williams Kumuyi, who delivered a message, regretted that Nigeria has failed to take advantage of its rich and abundant human and natural resources to manifest its greatness. He appealed to Nigerians to use the occasion of the independence to renew, reconcile, recommit and have rethink on the issues that had, possibly denied Nigeria its rightful place in the comity of developed Nations. President, Christian Association of Nigeria (CAN), Samson Olusupo Ayokunle, in his remarks, said there was need for Nigeria to appreciate and celebrate God for his obvious love for Nigeria. Prayer alter was raised for the peace and unity of Nigeria, as well as God’s intervention in the forthcoming 2019 general elections.